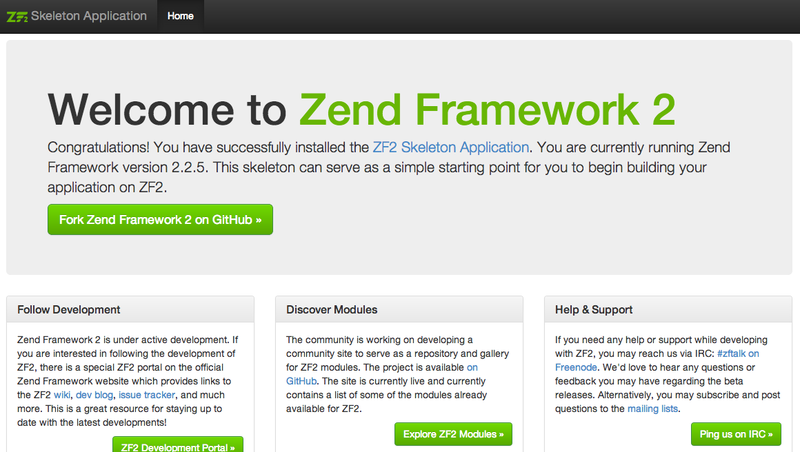 Here are a few easy steps to bootstrap your development using Zend Framework 2.x. This assumes that you are using PHP 5.3.x or higher on a *nix machine. Was tested to work on Fedora and CentOS. 3) Create your Apache virtual host (or any web server for that matter which you can easily find tutorials - search google: configure NGINX virtual host). Add your vhost configuration file by copying the sample virtual host configuration to a vhost file. The file path may vary depending on your OS and filesystem setup. 4) Add entry to your local host file, so you can check the skeleton App from your browser. 5) Check your running ZF2 skeleton Application from your browser. SVN: svn import https://your.svn.host/your/trunk -m "importing ulaptech files for the first time"
7) Point your skeleton app to your favorite PHP IDE/Editor - PhpStorm, NetBeans, SublimeText, Eclipse etc.